The jury in the Chai Vang murder trial has begun its deliberations, after hearing closing arguments from the prosecution and defense attorneys Friday morning. Vang is accused of killing shooting eight hunters, six fatally, in northern Wisconsin last November. Hayward, Wis. — (AP) - Jurors were given the case after the prosecutor said Vang's claim of self-defense does not hold up under the evidence presented. he defense attorney argued just the opposite. Wisconsin Attorney General Peg Lautenschlager said Vang can't reasonably claim he was defending himself when he opened fire on a group of hunters, killing six and wounding two others. But defense attorney Steven Kohn told jurors the state cannot prove who fired the first shot. Vang had testified he started firing only after one of the hunters shot at him first. "In the courtroom, the tie goes to the defendant," Kohn said. Lautenschlager said Vang ambushed some of the victims and chased down one. She detailed how each victim was shot and the damage each bullet did to their bodies. She reminded jurors Vang testified he felt two of the victims deserved to die because they called him names. "The physical evidence and the witness statements speak for themselves," Lautenschlager said. Vang, who testified Thursday, said he fired at the group of hunters because he feared for his life. He said he fired at the hunters only after a shot was fired at him. Vang, a 36-year-old Hmong American from St. Paul, Minn., said the shootings happened after one of the white hunters used profanities and racial slurs when angrily confronting him for trespassing in a tree stand used to hunt deer Nov. 21. He insisted he killed the hunters in self-defense, although the two survivors of the shootings testified earlier that only one shot was fired at Vang, and that was after he already shot some of the victims. Kohn said Friday the hunters' anger at Vang was driven by racial prejudice. "It really is the straw that stirs the drink. It is the catalyst," he said. He opened his closing arguments by telling jurors the trial was not about the Hmong community or Wisconsin's hunting culture, but about what happened when specific individuals confronted each other in the woods. Lautenschlager reminded jurors Friday how Vang testified he charged at the hunting group, firing. Lautenschlager said Vang had military training that taught him how to shoot people dead. Vang never said he actually saw any guns other than the one held by one of the surviving hunters, Terry Willers, she said. She said Vang ambushed two hunters who arrived to help their friends, and he chased Joey Crotteau down and shot him as he yelled for help. Before the closing arguments started, the judge gave jurors the option Friday of finding the man guilty on lesser homicide charges. Vang was charged with six counts of first-degree intentional homicide and three counts of attempted homicide. Sawyer County Circuit Norman Yackel told jurors they could reach one of three verdicts for each of the nine charges - guilty of first- or second-degree intentional homicide or attempted homicide or not guilty. A first-degree intentional homicide charge carries a mandatory life term. If convicted, Vang would face up to 65 years in prison on each second-degree intentional homicide charge. The judge denied a defense request to give the jury the option of finding Vang guilty of an even lesser charge, reckless homicide. For the sixth day, the courtroom was packed with about 100 people, most of them relatives and friends of the victims. 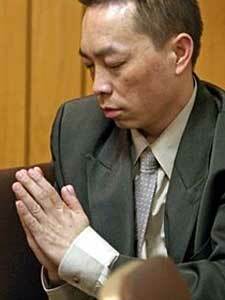 Vang, dressed in a business suit, sat at the defense table in front of about two rows of family and friends. Ten women and four men were picked for the jury, but after closing arguments two became alternates and 12 jurors will decide the case. The jury came from Dane County because of pretrial publicity in Sawyer County. The judge gave jurors the legal definition of self-defense and told them that under the law, they must consider whether Vang had "opportunity to retreat with safety."